In the afternoon of April 13th 1919, Brigadier-General Reginald Dyer marched his force of 50 soldiers into an enclosed area in the city of Amritsar known as the Jallianwala Bagh, where a crowd of several thousand had assembled to hear speeches. Unrest was growing across Punjab Province, as elsewhere in India, partly in protest at the draconian Anarchical and Revolutionary Crimes Act of 1919 (also known as the Rowlatt Act) which had been passed in the previous month and allowed the colonial government indefinite detention without trial and other emergency powers. Gandhi had responded by launching a campaign of satyagraha (non-violent resistance) but numerous acts of violent protest had also happened. General Dyer stationed his troops on the high ground by the entrance to the enclosure, and immediately gave the order to open fire on the assembled crowd. No warning was given. The Jallianwala Bagh had very few exits, and those available were narrow – too narrow to allow General Dyer to bring in his two armoured cars, as he had desired. The large (and unarmed) crowd was essentially trapped. The firing continued for about ten minutes, until ammunition was close to exhaustion, whereupon Dyer promptly marched his force away. The official account says that 379 people were killed, and perhaps around 1,000 injured; in reality, likely many more were killed. In the wake of the unrest in the spring of 1919, and the violent means used by the government in an attempt to supress the dissent, the Disorders Inquiry Committee (also known as the Hunter Committee, after its chairman) was established to investigate. 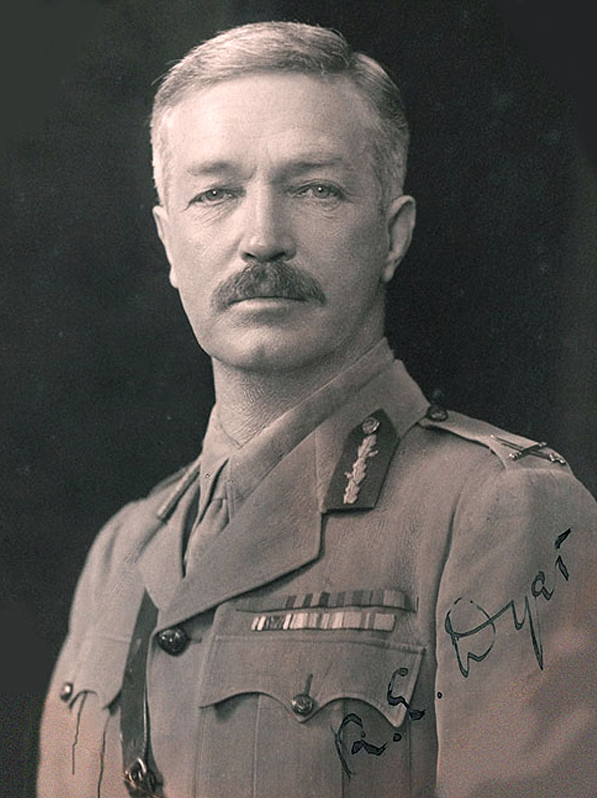 When it reported in 1920, Dyer was roundly criticised for his excesses, and he was retired from the Army. This raises a crucial question: in light of the imperial government disowning General Dyer in this way, are we to understand that his use of violence was exceptional in colonial rule? Were his decisions and actions at variance with the daily methods of policing and control that characterised empire? Whether structural violence (physical compulsion, acting on the body) or symbolic violence (social and mental practices, acting on the psyche), violence is intrinsic to any imperial project. Moreover, in order to be most useful as a means of compulsion, imperial violence needs to be public – people have to witness the capacity of the colonial state to cause harm to its subject population. This performative aspect of violence is thus crucial, and could in some cases become an end in itself. As Dr Kim Wagner has powerfully shown, General Dyer’s shocking act of violence in Amritsar must be seen as a continuity with other brutal instances of exemplary violence in India under the British Raj. Most notable is the practice especially associated with the Mutiny of 1857, in which rebels were executed by being ‘blown from the guns’. The gruesome spectacle of this form of punishment makes it particularly memorable for anyone unfortunate enough to witness it, giving it special value in this unpleasant sense. I fired and continued to fire until the crowd dispersed, and I consider this is the least amount of firing which would produce the necessary moral and widespread effect it was my duty to produce if I was to justify my action. If more troops had been at hand the casualties would have been greater in proportion. It was no longer a question of merely dispersing the crowd, but one of producing a sufficient moral effect from a military point of view not only on those who were present, but more especially throughout the Punjab. There could be no question of undue severity. Dyer also told the Committee that, as he approached the Jallianwala Bagh in his vehicle, he had already made up his mind to fire upon the crowd without warning: his decision was not based on an assessment of the situation under pressure. He was very consciously employing exemplary violence as a tool of colonial rule. Given the continuity between General Dyer’s methods on that day and the typical exercise of imperial rule, why then was he criticised by the authorities and ultimately fired? The performative aspect of his violence was not troubling to the authorities in itself, being a design feature of colonial power; the Hunter Committee itself said that, had Dyer merely given a warning first, firing on the crowd would have been absolutely fine. Indeed, there were other shocking episodes of exemplary and indiscriminate punishment from the period that have gone largely unremarked; for example, the use of aeroplanes to machine gun and bomb peaceful assemblies (as given in evidence to the Hunter Committee from Major Carberry and Lieutenant Dodkin, respecting action in Gujrunwala). In my view, General Dyer and his actions became a problem for the colonial authorities because of the publicity that he generated, and because of the way that he revealed the inner workings of the colonial complex of violence. In shooting dead at least 379 people, Dyer operated the machine of structural violence too flagrantly, or too clumsily, to pass unnoticed. Even then, however, he could have escaped censure had he said the right things. If he had testified to the Hunter Committee that he felt his men to be threatened, or that he judged a rebellion to be imminent, that would surely have been accepted as sufficient rationale (and would certainly have been accepted by the generally supportive press and public). With the unhelpful directness of a military man, however, General Dyer said the quiet part out loud in front of the Hunter Committee. By declaring his intentions to teach the whole of the Punjab a lesson through some cold-blooded killing, he divulged the disturbing calculus of decision that the imperial system would much rather have kept hidden. He showed the appalling racism of the colonial regime (can we imagine General Dyer gunning down a crowd of white people?) and its routine violence, which together exposed the “civilising mission” as a lie. General Dyer had thus created a public relations problem for the imperial authorities. Faced with his remarkably frank statements, the Hunter Committee felt obliged to criticise him. In respect of the main action at Jallianwala Bagh, for example, they say that “in continuing to fire for so long as he did it appears that General Dyer committed a grave error”. Ultimately, the Committee was supportive of Dyer’s effective sacking. These were not unreasonable orders in themselves… had they been wisely enforced little would have been heard of any special grievance over this single day. Everything promised well. But, in October 1919, the Hunter Committee were appointed. They reported on March 8, 1920, and on March 22 General Dyer was told that he must resign. I think General Dyer has very good ground for complaining of the manner in which he had been treated with reference to that Committee. He was called as a witness before it. He was never really told that he was on his own trial when that investigation was proceeding. No warning was given him. He had no legal assistance. He was cross-examined with very great ability by three members of the Commission, who were vakils, or pleaders, I understand, of very great ability in the Indian Courts. As a former Attorney General, Lord Finlay seems to be most exercised by what he sees as unjust procedures. This strongly suggests that the Hunter Committee served as a form of show trial, held to excise a problem and thus protect the system as a whole. This is a crucial point to remember: despite examining and criticising aspects of the functioning of the Empire, the Hunter Committee was serving to maintain and further that system of rule. They were not condemning imperial violence in itself, but effectively condemning General Dyer for getting into the newspapers.